For parents of one of the 6-million children with food allergies, trick or treating is a downright stressful occasion. Their child either skips it altogether and misses out on the experience or ends up with a bag full of potentially-fatal candy. Where’s the treat in that? Even if their kids don’t have allergies, many parents just don’t want their kids to come home with 50-pounds of candy. I’m not saying we should abolish candy (not at all, I love stealing from my son’s stash! ), but I do think that it’s super important to keep some alternatives on hand for the kids who want (or need) them. Of course, if you’re going to give out candy-free Halloween treats, you want it to be as equally awesome as the chocolate bars that the neighbor across the street is handing out. Don’t be that weird person who hands out floss or dental exam certificates. Unless, of course, you LIKE cleaning TP off your front yard! Instead, give out one of these super cool candy-free Halloween treats that kids will actually love! Let’s start with my favorite candy-free Halloween treat: Big Bucket of Monsters or Zombies! Actually, it’s more like a big tube. I got both the zombies and the monsters to check out. Jake swooped in to snag a handful right away. Each “bucket” comes with 100 pieces, plenty for you to hand out to all the cute little beggars! The Big Bucket of Monsters is my favorite. It comes with multiples of all your favorite creepy creepers, including: Frankenstein, Godzilla, Mummy, Cyclops, Werewolf, Demon, Lagoon, Dracula, Zombie, Giant Spider, Giant Moth, and even gravestones. A really great variety! Jacob likes the Big Bucket of Glow in the Dark Zombies best. Both are available on Amazon for $17.95 and $19.95 respectively, with Prime shipping, so you’ll get them by Halloween. They’re also available on SCS Direct. Along with fun monsters and zombies, you’ll also find Army Men, Sea Creatures, Safari Animals and more, so there’s something for everyone! Really cool temporary tats. Think along the lines of whatever is SUPER hot right now. Avengers, Descendants (turns out they’re not talking about the super cool punk rock bank), etc. Character bouncy balls- this can get a bit more expensive than, say, a bulk shipment of plain old bouncy balls, but if you just have a few kids coming to your house, cool character bouncy balls like these Despicable Me balls are super nifty! Two words: sticky hands. I don’t know why, but my son goes nuts for these things. They’re covered with my dogs’ fur in like 20 minutes, but he still insists we get them out of every bubble gum machine we pass. Plus they’re super cheap. You can get like 72 of them for about $6.50, which is way less than 72 pieces of the high-quality, “off the trading table” candy. Itty bitty rubber duckies! Everyone loves duckies! Teeny tiny notebooks for teeny tiny notes. Anything that makes noise, from little plastic kazoos to whistles to those weird straws that you swing around that whistle in the wind. Cute erasers (CUTE being the operative word, not those little nubby things you stick on the end of pencils, people. Those are basically the same thing as floss). Halloween party favors, like spider rings, vampire fangs, etc. Obviously, some of these things cost less in bulk than others, so consider your budget versus the number of kids in your neighborhood. My favorite is still the Bucket of Monsters, and not just because they sent me some to check out. They’re just plain neat and fun, plus you get a good amount for the money. 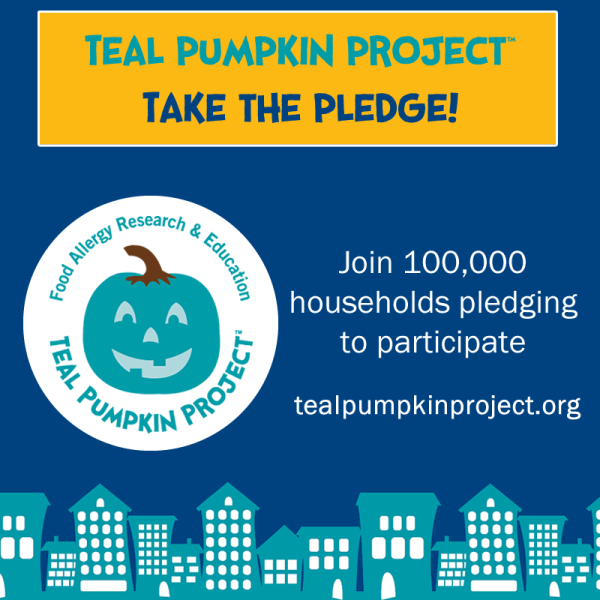 This post was inspired by the Teal Pumpkin Project, a national campaign that encourages treat-givers to offer candy-free options to trick-or-treaters. If you’re going to be handing out allergen-free alternatives, you can print out a Teal Pumpkin to hang on your door so parents know to bring their child by. Can you think of any other fun candy-free Halloween treats that kids will love? Share in the comments! I have some Bitsy’s Brainfood cookies that I plan to give out – they are organic and made with real veggies and fun because they are in the shape of letters. I love these other ideas too! These are wonderful ideas. You’ve also inspired me to take the pledge and hand out fun pencils to the kids who can’t have candy. I’ve been trying to figure out what I will hand out this year! Thanks for sharing these great ideas! I love this for so many reasons – not the least of which is that our youngest has super bad allergies. This is such a great way to make sure all kids get to have a fun time this Halloween. I love the idea of giving out candy-free Halloween treats. Most kids will have so much candy anyway, they won’t miss it and it’s especially appropriate for kids with allergies, etc. What a great list! This is quite a list of alternative treats to pass out! I passed out glow sticks last year, but there were many on here that I would not have even thought about. Thank you for putting this amazing list of ideas together! I love the teal pumpkin idea! I mean…there’s only so much candy you can eat anyway. Why not give kids toys that they can enjoy long after all candy wrappers are thrown away! I think this is really a great idea if you live in an area that multiple children have food allergies. Temporary tattoos sound like a nice gift to give out. Awesome ideas! I always loved getting the treats, that weren’t candy! I also loved the sticky hands, LOL! We have 5 pets, and they were filthy in minutes, but there is just nothing as fun as slapping a sticky hand onto the glass doors. LOL! I actually used to be afraid of them! And those things that you throw against a wall that sort of crawl down totally freaked me out, like in tears. I was a, well, unique child! 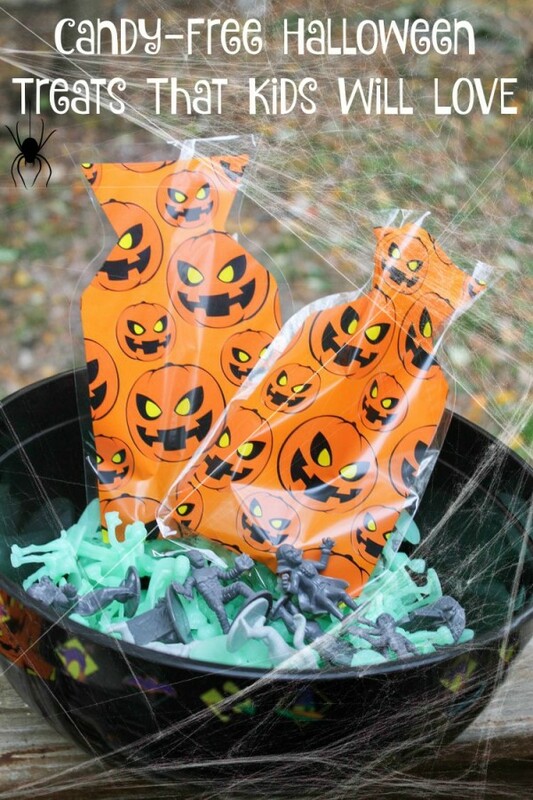 What a fabulous idea to give children something besides candy for Halloween. They will still get plenty of candy and also have something lasting and or that they can play with. Candy-free and Halloween treats sometimes doesn’t go well right? But this post gives me great idea on what to do next. Thanks! i love this! 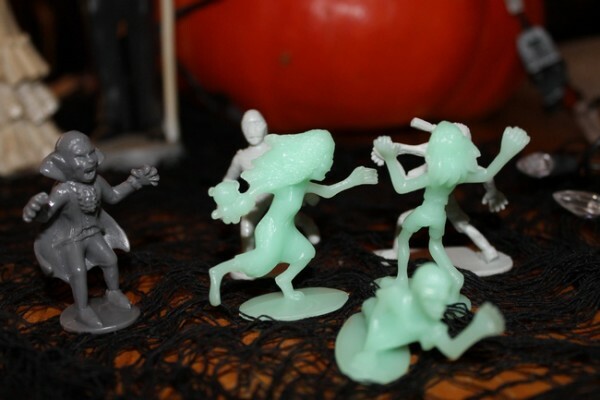 i’m going no candy for the younger kids and i like this idea of the little figurines. that’s such a great idea. What a great idea! It’s hard when kids have allergies. But, these look like totally fun ideas. My kids would love temporary tattoos. These are such cute ideas for candy-free Halloween ideas! Thanks for sharing. I think this is an excellent idea. Frankly my kids get way to much sugar on their teeth and this is a nice alternative.